Driving a car, your relationship with the road is like that with a friend. Bumps are softened. On a motorcycle, the relationship is much more intimate, like that with a lover. You feel every small bump and dip. This is the unfolding story of motorcycling and me. While I'd toyed with the idea of riding for several years, I'd never thrown a leg over a motorcycle until I was 51. Then the time seemed right. My youngest kid had finished high school so I considered myself expendable. I'd just spent two years with every waking moment was consumed writing a book. With it completed, I again owned my life and was looking for a new obsession. My driving force in life has always been pushing myself, taking on new challenges and mastering new skills. I thrive on exploring new places and always prefer to be outside with the wind on me as much as possible. So I gravitated to riding. As I contemplated this big plunge, I made several assumptions. One was that riding a motorcycle would save money given that gasoline prices had just spiked. A second was that royalties from the book would pay for a motorcycle. But most of all, I assumed that having put in thousands of miles on road racing and mountain bicycles, and manual transmission cars for years, I'd pick up motorcycle riding easily. These assumptions all turned out to be wrong. What I spent on motorcycling far exceeded any savings from higher gas mileage. I didn't sell enough books to cover the costs. And learning to ride was much, much more difficult than I expected. But it was also much more fulfilling. In life, I've always wanted to be where I'm not. And I'm rushing to get there. In the few years since I began riding, I've fallen passionately in love with it. The average American motorcyclist rides 1800 miles per year. I did 16,000 my first year, 18,000 the second, and over 20,000 in the third. I've continued to average 15,000 to 16,000 miles per year even when I began writing a weekly column that eats up much of my Sundays. At night I often dream of squiggly lines on a map. Seriously. When everything is clicking--I'm alone on a winding country road, I've got my "A" game, the music is in a groove--I sometimes forget the motorcycle is there and feel like I'm simply flying. If you don't want to take my word for it, trust Alton Brown. Luckily, I live close to some fine riding, with twisty roads over mountain ridges, large state forests, miles of farmland (which often requires dodging Amish buggies), charming little towns (each different from all the others), and lots of historic sites. There's always somewhere new to see. (Here's a map of my favorite routes and road food). I particularly like combining riding with photography--one of my other passions. When I began this blog I was riding a 2010 BMW R1200R. In BMW jargon, this bike was a "hexhead" (named because the engine cylinder covers are hexagonal). So these are the "Hexhead Diaries." I'll update them regularly with stories and pictures. Stay tuned! A week old motorcycle I'd become one and fallen in love with. Gorgeous weekend with plans to attend the Reading, PA World War II air show. 2,000 mile business/pleasure trip planned for next week in intricate detail. It would have included some of the most iconic motorcycle roads in the U.S.: the North Carolina section of the Blue Ridge Parkway, Devil's Whip, Tail of the Dragon, Cherhola Parkway. I'd finally figured out all of the electronics on the bike including the sound system. Then this. No hard information other than that terse note. 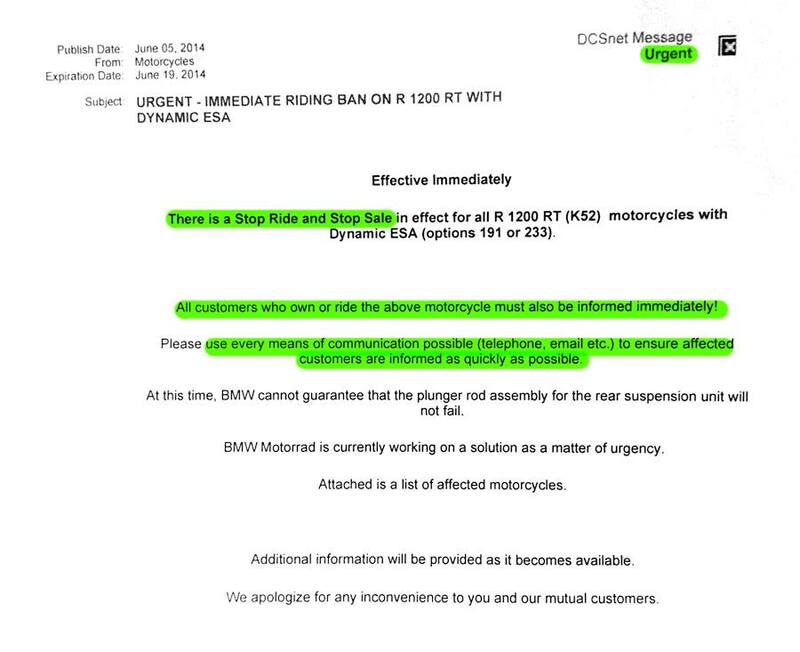 Rumors online that it may take months--the whole summer riding season--for BMW to find and deploy a solution. Lots of people will abandon the marque over this. Frustration is high because it applies only to people with new bikes many of whom, I'm sure, had also fallen in love with it and planned long trips. I wish I'd looked more closely at the Triumph. A former college professor, now the director of research at a think tank that deals with national security policy and military strategy, and author of a weekly column on those topics. Avid photographer and cook. A fan of single malts, good cigars, and Dobermans. A victim of wanderlust and fan of reckless abandon.